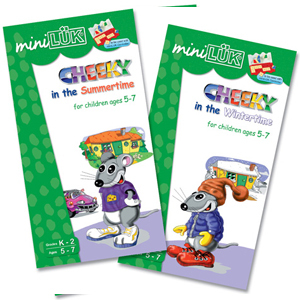 These 2 workbooks feature summer and winter themes which will help children learn. These exercises enhance children's overall developmental skills in visual perception, differentiation of colors and shapes, recognition of alphabets, basic mathematical skills, logical thinking and reasoning, and linguistics ability. Follow Cheeky into the world of learning. In this workbook Cheeky introduces the essential elementary skills to children using colorful picture stories. Visual recognition and differentiation, association ability, thinking skills, alphabets, and basic math skills are all covered. The various scenes and subjects presented in this book could also be used creatively by parents and educators to initiate conversation with young children to promote their language development. In this workbook Cheeky introduces the essential elementary skills to children using colorful picture stories. Visual recognition and differentiation, association ability, thinking skills, and basic math skills are all covered.